Does Smoking Play a Role in Mesothelioma Diagnosis? Smoking is a risk factor for more than a dozen types of cancer as well as many other benign illnesses, and for decades doctors have warned against tobacco smoke’s power to cause disease. However, smoking does not significantly increase a person’s chance of developing mesothelioma, the rare type of cancer commonly associated with asbestos. While cigarettes are the No. 1 cause of cancer deaths in the U.S., asbestos exposure is the leading cause of occupational cancer deaths. Every year, asbestos related-diseases afflict thousands of Americans. The majority of these patients are elderly men who spent years in occupations that regularly exposed workers to asbestos-containing materials. Secondhand exposure and environmental exposure further endanger people of all backgrounds. Mesothelioma is the signature cancer of asbestos, because asbestos exposure is the sole cause in the vast majority of cases. However, smoking does play a role in the development of other asbestos-related diseases. In combination, smoking and asbestos exposure multiply the damage done to lung tissue. When it comes to lung cancer, it can be difficult to determine whether smoking or asbestos exposure is the primary cause. Smoking increases your risk of developing certain asbestos-related diseases, and it can also worsen mesothelioma symptoms. Inside the airways of your lungs, there are tiny brush-like structures called cilia that sweep out dust particles. This is one of the natural ways your lungs keep themselves clean. Cigarette smoke damages your cilia, which can enable microscopic asbestos fibers to accumulate in your lungs faster. 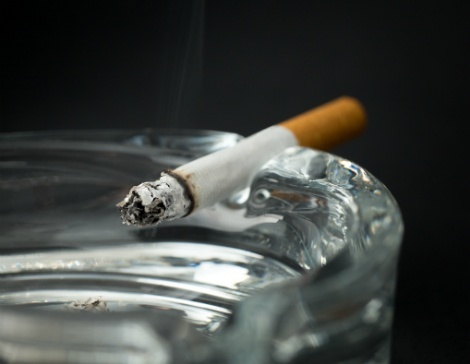 Cigarette smoke and asbestos fibers can cause the buildup of scar tissue in your lungs. Medical evidence suggests smoking also changes the way your body reacts to asbestos fibers, causing scar tissue to build up around them even faster. When scar tissue makes it difficult for your lungs to expand when you inhale, this condition is called pulmonary fibrosis. Fibrosis linked to asbestos exposure is known as asbestosis. Cigarette smoke can also gradually destroy the tiny air sacs in your lungs, or alveoli, which transfer oxygen from the air into your bloodstream. Many asbestos-related illnesses cause breathing difficulty, and alveoli damaged by smoking will only make it worse. Finally, cigarette smoke contains numerous toxic chemicals that can cause cancerous changes in cells, just as microscopic asbestos fibers can. Lung cancer and mesothelioma are sometimes confused, because in their late stages they often affect the same areas of the body and present the same symptoms. The two cancers originate in different types of tissue, however, and they have different causes. Lung cancer is typically linked to smoking, but it can also be caused by exposure to several other toxic substances, including asbestos. Most asbestos-related cancer deaths are in fact attributed to lung cancer. The combination of smoking and asbestos exposure multiplies a person’s risk of developing lung cancer, increasing the risk much more than simply adding the two risk factors together. However, there is a key difference between smoking and asbestos exposure: After a person quits smoking, the lung damage caused by the smoke gradually heals. Asbestos fibers often remain lodged in lung tissue permanently. Asbestos exposure is the culprit in almost all diagnoses of mesothelioma. In very rare cases, mesothelioma may be linked to other minerals similar to asbestos, radiation exposure or an unknown cause. Asbestos fibers do not dissolve after they are inhaled or swallowed. Over many years, trapped fibers can cause cancerous changes in the protective tissue surrounding various organs. Asbestos fibers most commonly accumulate in the pleura (lining of the lungs) or the peritoneum (lining of the abdominal cavity), though in very rare cases mesothelioma can develop in the lining of the heart or testes. The toxins in cigarettes cannot penetrate as far as asbestos fibers can, which is why smoking is not a risk factor for mesothelioma. Although mesothelioma patients should always avoid cigarette smoke for the sake of their health, a history of smoking does not disqualify a patient from filing a legal claim based on a mesothelioma diagnosis. Decades of medical evidence have established the link between mesothelioma and asbestos exposure, so the real work of filing a claim for compensation involves carefully documenting the patient’s diagnosis and asbestos exposure history. The most challenging aspect may be determining where to file the mesothelioma claim, as different patients will be eligible for different types of compensation. A lawyer experienced with asbestos-related claims can help you make this decision. In certain cases, doctors attribute asbestos as the primary cause of lung cancer. Only about 4 percent of all lung cancer diagnoses in the U.S. fall into this category, but the number of these cases — an estimated 6,000 each year — is still twice as high as the annual number of mesothelioma diagnoses. An experienced lawyer can evaluate a lung cancer patient’s potential to benefit from filing an asbestos-related claim.